Aug 2013. The first stage of the Sorell Municipality Tracks and Trail Strategy, the Sorell Waterway Trail, is complete. 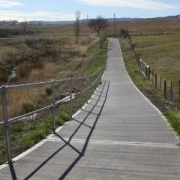 The 2.5m wide concrete trail starts at Pioneers Park and meanders along the Sorell Rivulet. Interpretive signs and storyboards are stationed along the path and a composite fibre and recycled plastic bridge has been installed over the rivulet. Sport & Recreation Tasmania contributed funding to the project which provides a valuable recreational space for walking as well as riding.